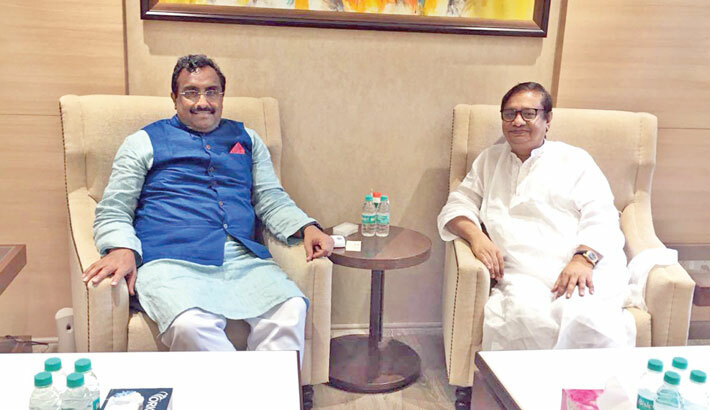 Zaker Party Chairman Khwaja Mostafa Amir Faisal Mujaddedi met with National General Secretary of the Bharatiya Janata Party (BJP) Ram Madhav in New Delhi. Two leaders of Zaker Party, Dr Khwaja Saim Amir Faisal Mujaddedi and Farah Amir Faisal, were also present at the meeting. It may be mentioned that at an invitation of the Indian Council for Cultural Relations (ICCR), a high-level delegation of Zaker Party led by the party chairman are now in India on a ten-day official visit. In the meeting, they discussed bilateral relations between India and Bangladesh, development issues, multi-party democracy in the region and the upcoming national parliamentary election in Bangladesh, says a press release.